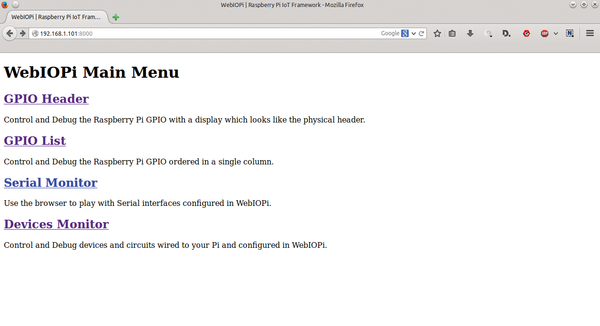 Using WebIOPi, you can transform a humble Raspberry Pi into a powerful and versatile web-connected device. The ability to access and control Raspberry Pi and connected devices via a web-based interface opens a whole new world of creative possibilities. Although it's not beyond the wit of man to develop a custom web-based interface from scratch, using WebIOPi makes a lot of sense. Getting the most out of WebIOPi does require some technical chops, but using the framework to create relatively simple web apps is not all that complicated. to install. That's all there is to it. Once WebIOPi is up and running, you can point your browser to http://raspberrypi:8000 (replace raspberrypi with the actual IP address or domain name of your Raspberry Pi) and log in using the webiopi username and the raspberry password. (See the "Changing Password" box.) If everything works properly, you should see a web page with links to different sections (Figure 1). 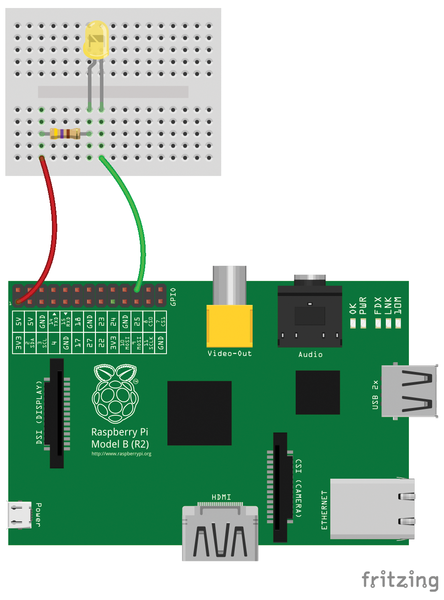 Click on the GPIO Header link to switch to a simple web app for controlling the GPIO pins. Figure 1: WebIOPi features a bare-bones interface. 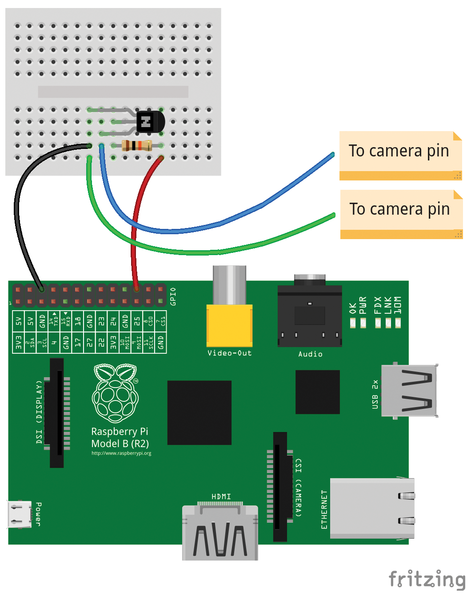 Using the app, you can turn a specific GPIO pin on and off by pressing the button next to it. To do so, you can wire an LED and a 270Ohm resistor (Figure 2) and connect them to the 3.3V and GPIO 25 pins. In the web app, pressing the button next to GPIO 25 toggles the status between IN and OUT to turn the LED on and off. Figure 2: LED wiring diagram. Now, point your browser to http://raspberrypi:8000, and you should see the new web app in all its bare-bones glory. Press the button to turn the LED on and off. Besides the id and label parameters, the webiopi().createButton routine also supports an optional parameter that can be used to create a button with its own function. Using this functionality, you can modify the created web app to control the transistor switch described in a previous article . As you may recall, this transistor switch was controlled using a simple Python script that turned the target GPIO pin on and off at a 0.5-second interval. To run the script, you had to execute it manually from the command line or configure Raspberry Pi to start the script on boot. Using WebIOPi, you can replace the script with a simple web app that lets you control the transistor switch via a button. 10                 var sequence = "01"
This function does two things: It defines a signal sequence and outputs it to a GPIO pin at a specific interval in milliseconds. In this case, the sequence turns the pin on and off at the 0.5-second interval. The webiopi().outputSequence routine, in turn, calls the sequenceCallback function, which displays an alert message that serves as a confirmation that the code has been executed successfully. Now, set up a transistor switch as shown in Figure 3 and use the created web app to trigger it. In this particular case, the transistor switch triggers an SLR camera, but it can be easily put to a variety of other uses. Figure 3: Transistor switch wiring diagram.